Confined Animal Feeding Operations, or CAFOs, are a reality of our nation’s growing demand for meat, eggs and milk. These operations raise large numbers of animals in small spaces. Food is brought to the animals since there is no space to graze at factory farms, and the animal waste is collected in lagoons. Unfortunately, CAFOs have a substantial impact on the environments in which they are situated. It is well documented that these operations present significant risks to ecosystems and local residents. In addition to environmental degradation, studies demonstrate strong links between CAFOs and serious physical and psychological illness in humans. Furthermore, CAFOs are disproportionately located in close proximity to low-income and minority communities; thus, the risks are borne by those least able to relocate. Current Clean Water Act CAFO regulations insufficiently address both the environmental and human impacts of the facilities. CAFOs are regulated as point sources under the Clean Water Act (CWA), with EPA’s first set of regulations for CAFOs enacted in 1976. CAFO regulations have only been revised twice since that time—in 2003 and 2008—and there have been near constant challenges from both industry and environmentalists. In 2001, environmental advocates alleged that the 1976 CAFO Final Rule did not meet the objectives of the CWA because it was not stringent enough to provide protection to local water sources. Chief among the environmentalists’ complaints was the fact the CAFO regulations had not been updated despite rapid growth and change in the agricultural industry. EPA issued a revised Final Rule in 2003 providing much stricter oversight, including provisions that all CAFOs obtain a permit regardless of actual discharge. CAFOs certain that they would not discharge could apply for a waiver, but industry immediately challenged the Rule as beyond EPA’s authority. The court held for industry on the issue of permitting, finding that it was impermissible for EPA to require a permitting for the mere potential of discharge. The 2008 Final Rule for CAFO regulation reflected this decision, and the EPA relaxed the permit requirement to include only those that proposed to discharge. The most recent suit, initiated by the pork industry, contested the EPA rule because it required all producers with the potential to discharge to obtain a NPDES permit. The court vacated the requirement that all CAFOs merely proposing to discharge obtain a permit, but upheld the permitting obligations for CAFOs that do discharge. EPA promulgated a new Final Rule in response to the court’s decision that eliminates all of the permit requirements for CAFOs that do not actually discharge. Included instead are mandatory reporting provisions for all operations. Under the newest Final Rule, CAFOs would be required to submit information about their discharges to the EPA. The Rule is currently under OMB review, but if approved, it will likely face another round of challenges. CAFO regulation has devolved into an endless cycle of polarized litigation. Instead of providing a forum for negotiation and solution building, legal challenges keep industry and environmentalists battling single-mindedly against the EPA. Meanwhile, the factory-farm industry continues to grow, and its implications for the health of citizens and environmental degradation become more severe and widespread. At this point, it is clear that alternative solutions to the issue of CAFOs are needed. Citizens should become more empowered to take an active role in understanding and disseminating information regarding the effects of CAFOs, and importantly, should be encouraged to utilize the citizen suit provision of the CWA in response to permit violations. In allowing suits to be brought by private individuals, citizen suits can extend the reach of environmental enforcement and supplement the limited resources of the EPA. Such actions would likely be brought with increased frequency if residents located near CAFOs were better aware of the circumstances under which they could bring suit for violations. Further, CAFO owners to report all discharges as proposed in the most recent rulemaking would reduce the fact-finding burden for citizens. In order to bring suit, the plaintiff must substantiate his claim that the facility’s discharges violate its permit, or that a permit is required, and independent investigation would require open access and resources beyond the means of the average citizen. At the same time, industry should be incentivized to establish practices that allow them to continue their operations while also containing discharges. 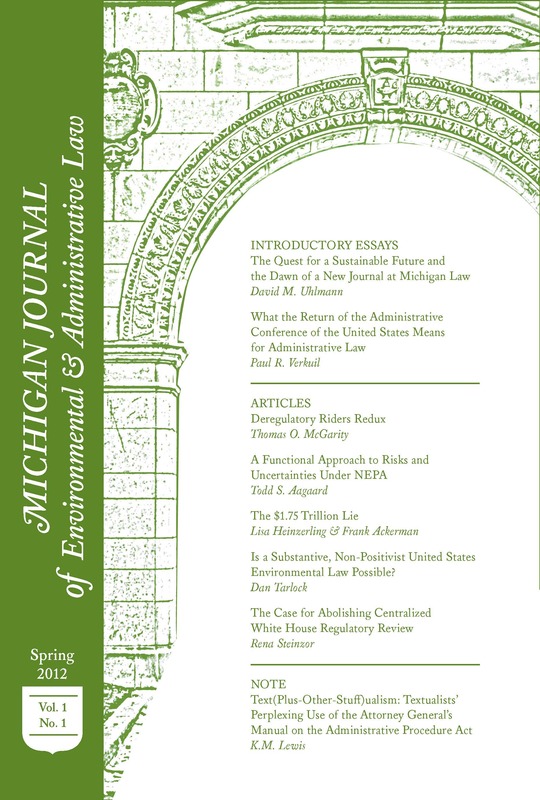 Market-based systems that requires firms to purchase permits for all discharges have been successful in reducing emissions under the Clean Air Act, and would likely be especially effective in controlling effluent from nonpoint sources under the CWA. Under a system of tradable permits, firms that emit less do not need to purchase as many permits, and they can also resell unused allowances for a profit. Because nonpoint source regulation is much laxer than point source legislation, initial improvement could be made inexpensively, and firms would thus receive high returns on their efforts. After more than 30 years of legal battles resulting from the promulgation of EPA regulations, it is time to consider alternative methods for protecting local communities. –Megan Anderson is an editor for MJEAL. EPA defines a CAFO as an Animal Feeding Operation (AFO) that meets specific conditions regarding the number of animals confined. An AFO is defined as an operation that “confine[s] animals for at least 45 days in a 12-month period, and [does not have] grass or other vegetation in the confinement area during the normal growing season,” http://www.epa.gov/region7/water/cafo/index.htm. See generally National Pollutant Discharge Elimination System Permit Regulation and Effluent Limitation Guidelines and Standards for Concentrated Animal Feeding Operations (“CAFOs”), 68 Fed. Reg. 7176, 7189 (Feb. 12, 2003); SG Von Essen, Health Effects from Breathing Air Near a CAFO, 10 Journal of Agromedicine 55, available at: http://www.ncbi.nlm.nih.gov/pubmed/16702123. Sacoby M. Wilson et al., Environmental Injustice and the Mississippi Hog Industry, 110 Envtl. Health Persps. 195 (2002). 41 Fed. Reg. 11,458 (Mar. 18, 1976). 68 Fed. Reg. 7176, 7266 (Feb. 12, 2003). Waterkeeper, 399 F.3d 486 (2d Cir. 2005). 73 Fed. Reg. 70,418 (Nov. 20, 2008). National Pork Producers Council v. EPA, 5th Cir, May 2011. A system of marketable permits was implemented under the Clean Air Act in order to resolve the problem of acid rain. See Acid Rain Program 2007 Progress Report, Clean Air Markets – Air & Radiation, EPA, January 2009 available at: http://www.epa.gov/airmarkt/progress/arp07.html. Next Protecting Those Who Need it The Most: Does New York Need to Rethink its Regulation of State Institutions for Persons with Disabilities?